(Mentioned) Village Bell Dec 1988 The article reads: ORCHARD HISTORY. The man who planted the late Ted Hamilton's orchard was Mr. R. H. BUNT, not HUNT as stated. He did it at weekends after putting in a 48 hour week at Toomuc Valley orchard, then owned by one of the Kitchen Brothers, of whom there were three. Between them they held a chain of properties from Toomuc Valley to Berglund Road. One planted the orchard (280 acres originally), another who loved the bush untouched built "Caversham Heights" and the third built "The Towers" and established the marvellous garden which used to surround it. They also made soap. [S5] Registry of Births Deaths and Marriages Death Index Victoria 1921-1985 "#D22805 age 83 [par Richard H DUNT & Annie Elizabeth]." [S5] Registry of Births Deaths and Marriages Death Index Victoria 1921-1985 "#D22779 age 86 [par Thomas LORIMER]." [S15] Newspaper - Village Bell "065-1988, p2 by Ken Hudson." 1-112-B Hunt Catherine A. F 21/03/1908 435. Lorimer Nanette Elizabeth 1929 infant dau/ William Kenworth & Catherine Marshal (-Bunt). [S35] Probate Records, PROV (Public Records Office Victoria), VPRS 28/P4, unit 3698; VPRS 7591/P3, unit 628. [S6] Registry of Births Deaths and Marriages Marriage Index Victoria 1921-1942 "as Alexander St Leger HENRY." [S11] Newspaper - Argus 20 Nov 1923 p1. [S5] Registry of Births Deaths and Marriages Death Index Victoria 1921-1985 "#D22823 age 57 - as HENRY." [S22] Victorian Government. BDM Index Victoria (online) "Place of Birth Traralgon." Harold Michael Mervyn Horan had been with the 29th Australian Light Horse before he enlisted on 5 Feb 1916. He was promoted to Lieutenant straight away and embarked with the 8th Light Horse, 15th Reinforcement from Melbourne on 7 Apr 1916 on board HMAT A43 Barunga. He was promoted to temporary Captain on 12 Jun 1917 and returned to Australia on 15 Jun 1919. He continued serving in the army until 10 Jul 1945. 9 Dec 1915, Lieut. Harold M. M. Horan to Miss Violet C. Berglund. A picturesque military wedding was celebrated on Saturday, November 20, at St. Philip's Church of England, Hoddle-street, Abbotsford, when Lieut. 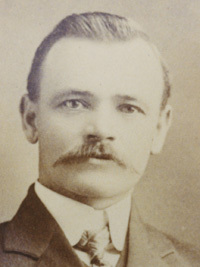 Harold M. M. Horan, eldest son of Mr. and Mrs. Horan, of Abbotsford, was united to Miss Violet C. Berglund, only daughter of Mr. C. A. Berglund, J.P., and Mrs. Berglund, of Collingwood and Upper Beaconsfield. The church was decorated for the occasion and the Rev. H. B. Hewitt officiated. There was a fully choral service. The choir preceded the bridal party from the church, and during the signing of the register Miss Taylor rendered a solo. The bride, who was given away by her father, wore a gown of ivory crepe de chine, the bodice being of Limerick lace. The long court train hung from the shoulders and was finished with true lovers' knots, sprays of tulle roses and a horseshoe. The veil of Limerick lace was the gift of Miss E. Mitchener, friend of the bride. A sheaf of Madonna lilies, orange blossom and asparagus fern tied with tulle streamers was carried, which, with a gold pendant locket, were the gifts of the bridegroom. The bride's present to the. bridegroom was a travelling bag. Miss M. Horan (sister of bridegroom), Miss May Ireson and Miss Nellie Geraghty were the bridesmaids, and wore dainty white voile frocks with collars of shell-pink ninon and head-dresses of pink chiffon aeroplane bows. Master Hector Bennett acted as page and wore a white satin suit and large satin hat with lancer plume. Miss Elsie Falletta (cousin of bride), in a quaint long satin frock and bonnet of satin finished with plume, was trainbearer, and little Violet Beisley carried the satin cushion on which the bride knelt. Each maid carried a posy of pale pink Cecil Brunner roses, carnations and asparagus fern, tied with satin streamers. To the first and second maids the bridegroom gave silver bags, and to the third maid a gold bar brooch set with aquamarines; to the page gold sleeve-links, and the two little girls gold brooches. On leaving the church the bride was handed several horseshoes. The bridegroom was attended by Mr. George Clawes (his cousin) as best man, and the groomsmen were Mr. W. A. Berglund (brother of bride) and Mr. P. Horan (brother of bridegroom). 12 Jan 1916, WEDDING HORAN-BERGLUND. A picturesque military wedding was celebrated on Saturday, November 20, at St. Phillips Church of England, Abbotsford, when Lieut Harold M. Horan, eldest son of Mr and Mrs Horan of Abbotsford was united to Miss Violet C. Berglund, only daughter of Mr C. A. Berglund, J.P., and Mrs Berglund of Collingwood and Upper Beaconsfield. The church was decorated for the occasion, and the Rev. H B Hewitt officiated. The choir preceded the bridal party from the church, and during the signing of the register Miss Taylor rendered a solo. The bride, who was given away by her father, wore a gown of ivory crepe de chine, the bodice being of Limerick lace. The long court train hung from the shoulders and was finished with true lovers' knots, sprays of tulle roses and a horseshoe. 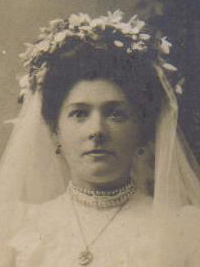 The veil of Limerick lace was the gift of Miss E. Mitchener, friend of the bride. A sheaf of Madonna lillies orange blossom and asparagus fern tied with tulle streamers was carried which, with a gold pendant locket, were the gifts of the bridegroom. The bride's pre sent to the bridegroom was a travelling bag. Miss M Horan (sister of the bridegroom), Miss May Ireson and Miss Nellie Geraghty were the bridesmaids, and they wore dainty white volle frocks with collars shell-pink ninon, and head-dresses of pink chiffon aeroplane bows. Master Hector Bennett acted as page and wore a white satin suit and large satin hat with lancer plumes. Miss E. Faterra, cousin of the bride, in a quaint long satin frock and bonnet of satin finished with plume was trainbearer, and little Violet Beisley carried the satin cushion on which the bride knelt. Each maid carried a posy of pale pink Craft dranner (?) roses, carnations and aspargus fern, tied with satin streamers. To the first and second maids the bridegroom gave silver bags and to the third maid a gold bar brooch set with aquamarines; to the page, gold sleevelinks and to the two little girls, gold brooches. On leaving the church the bride was handed several horseshoes. The bride groom was attended by Mr Geo. Clawes (his cousin) as best man, and the groomsmen were Mr W. A. Berglund and Mr P. Horan. 1 Feb 1947, STRANDED AND FAR FROM HOME, BUT 5-YEAR-OLD KEEPS CALM. Five-year-old Christopher Glur, recently acquired and much-travelled South African immigrant, was the only one who remained completely calm when the Taroona sailed for Tasmania without him last night. Found standing on the wharf watching the Taroona depart, he blaridly explained to perturbed by-standers that he should have been on the ship with his aunts, but he had gone ashore to look after the luggage and the ship had sailed without him. He was taken hurriedly to Victoria Dock police station, where the police gradually extracted his story. Christopher had come to Australia from Johannesburg on the Nestor "not very long ago." He had arrived in Melbourne yesterday morning from Sydney, and had slept on the train. When the train reached Melbourne he had gone straight to the Taroona with his two aunts-Aunt Edith (he didn't know her other name) and Aunt Dorothy Schultz. He had left the ship with Aunt Dorothy to look for the luggage. His aunt told him to watch for it while she checked at the office. Then the Taroona had sailed. Meanwhile D24 had received a cable message from the Taroona asking that the child be given to Mr Harold Horan, of Kent st, Kew, to mind. A mobile patrol was sent to the dock to collect Christopher and take him to Russell st, pending Mr Horan's arrival. [S50] Miscellaneous Source, in endnotes No 22 on page 788. Hooves, wheels & tracks : a history of the 4th/19th Prince of Wales's Light Horse Regiment and its predecessors / David Holloway. [S14] Newspaper - Table Talk, 30 Sep 1915, p8. [S29] Nominal Roll, Australian War Memorial - WWI, Punch (Melbourne), 7 Oct 1915, p27. [S5] Registry of Births Deaths and Marriages Death Index Victoria 1921-1985 "#D19769 age 75 [par Michael John HORAN & Ellen GERHURTY]." [S14] Newspaper - Table Talk, 9 Dec 1915, p8. [S14] Newspaper - Berwick Shire News and Pakenham and Cranbourne Gazette, 12 Jan 1916, p3. [S11] Newspaper - Argus 1 Feb 1947 p3. [S2] Registry of Births Deaths and Marriages Federation Index Victoria 1889-1901 "#B10693." [S61] Upper Beaconsfield History Archive ,"Family Tree." [S185] Property Titles. ; PROV (Public Records Office Victoria), C/T 1098-419 + C/T 2949-796 - Charles Alexander Berglund died on 22 May 1953 - Probate of his will granted to The Perpetual Executors and Trustees Association of Australia Ltd of Queen Street Melbourne and Violet Catherine Horan of 17 Kent Street Kew Married Woman. [S185] Property Titles. ; PROV (Public Records Office Victoria), C/T 1120-996 - Violet Catherine Horan of 17 Kent Street Kew Married Woman - C/T 8049-173. [S185] Property Titles. ; PROV (Public Records Office Victoria), C/T 2949-796 - C/T 8177-266 - Catherine Violet Horan of "The Towers" Upper Beaconsfield Married Woman. [S185] Property Titles. ; PROV (Public Records Office Victoria), C/T 7726-012 - Violet Catherine Horan of "The Towers" Upper Beaconsfield Married Woman. [S185] Property Titles. ; PROV (Public Records Office Victoria), C/T 8177-266 - Dalkeith George Noel Chambers of 203 Booran Road Caulfield South Earth Moving Representative - C/T 8237-109. [S185] Property Titles. ; PROV (Public Records Office Victoria), C/T 8177-266 - Catherine Violet Horan (herein called Violet Catherine Horan) died on 29th August 1972. Probate of her will has been granted to Mervyn Berglund Horan of 14 Kalimna Street Balwyn Manager. [S185] Property Titles. ; PROV (Public Records Office Victoria), C/T 8177-266 - C/T 9028-139 Mervyn Berglund Horan of 14 Kalimna Street Balwyn Manager. [S185] Property Titles. ; PROV (Public Records Office Victoria), C/T 8049-173 - Bertram William Horan of 35 Ropley Avenue Balwyn Commercial Pilot. [S185] Property Titles. ; PROV (Public Records Office Victoria), C/T 9028-140 - Bertram William Horan of 35 Ropley Avenue Balwyn Commercial Pilot. [S185] Property Titles. ; PROV (Public Records Office Victoria), C/T 7726-012 - Bertram William Horan of 35 Ropley Avenue Balwyn Commercial Pilot. [S11] Newspaper - Argus 18 Aug 1938 p3. BERGLUND, Sarah Kate - On March 15, at 17 Kent street Kew loved mother of Charles Bertram (deceased), Violet and William, loving grandmother of Mervyn Bertram and Lois Horan and, James, Shirley and Robert Berglund, great grandma of Lewis Sally-Ann and Anthony Horan. [S5] Registry of Births Deaths and Marriages Death Index Victoria 1921-1985 "#D2568 age 83 [par James LALOR & Catherine HIGGINS]." [S5] Registry of Births Deaths and Marriages Death Index Victoria 1921-1985 "#D5570 age 88 [par Gustave BERGLUND & Greta PETERNELSON]." [S1] Registry of Births Deaths and Marriages Pioneer Index Victoria 1836-1888 "#M1653 Charles born Collingwood, Sarah Kate born Carlton." [S61] Upper Beaconsfield History Archive ,"Sarah's parents were both Irish." [S11] Newspaper - Argus 16 Mar 1953 p13. [S20] Various indexed records of GSV - Genealogical Society Victoria "not listed on GSV Index." [S11] Newspaper - Argus 23 May 1908, p23. [S11] Newspaper - Argus 17 Jan 1948 p3. [S11] Newspaper - Argus 6 Apr 1953 p14. The Berglund family had Berglund Road named after them. Death-Notice* 23 May 1953 BERGLUND, Charles Alexander, of The Towers Upper Beaconsfield.-On May 22 at Epworth loved husband of the late Kate loving father of Bertram (died in France), Violet (Mrs H M Horan, Kew), and William (South Australia), grandfather of Mervyn, Bertram and Lois Horan and James, Shirley and Robert Berglund, great grandfather of Lewis, Sally-Ann and Anthony Horan, aged 88 years. 12 Mar 1936, FLAMES RISE 60 FEET. Homes Were in Danger. UPPER BEACONSFIELD, Wednesday. -A roaring inferno of fire, in which flames readied a height of 60ft., confronted fire-fighters at a break between the properties of Mrs. I. S. Norbury and the Rev. T. Howard Smith at Upper Beaconsfield to-day. Fanned by a northerly wind, the fire, which had been under control on Tuesday night, broke out afresh this morning, and within a few hours huge clouds of smoke reduced the range of visibility in some parts of the district to 10 yards. 22 Mar 1948, TRANSFER of LAND ACT 1928.-No. 855, Sec. 87.-Title claimed by adverse possession to land comprised in Crown Grant, Vol. 1120, Fol. 223996, whereof GEORGE THOMSON, of Melbourne is the registered proprietor. Charles Alexander Berglund, of Upper Beaconsfield, farmer, has applied for a vesting order vesting in him for an estate in fee simple, free from encumbrance, the land described below. The Commissioner of Titles has directed notice thereof to be advertised in the "Argus," and has appointed twenty-one days from the advertisement, after which time the application may be granted unless a caveat is lodged forbidding the same. Dated 18th March, 1948. LAND.-Crown Allotment forty two section C, parish of Gembrook, county of Mornington. Commencing at the south-west angle of the said Crown allotment: thence by a fence, a line, a fence, a line and a fence along Crown allotment thirty-eight north- easterly 2176 links, a fence along Crown allotment seventy-three south-easterly 1022 links, a fence, and a line along Crown allotment forty-three south- westerly 1784.5 links, and a line and a fence along a Government road north- westerly 326 links, and westerly 796.7 links to the commencing point. [S1] Registry of Births Deaths and Marriages Pioneer Index Victoria 1836-1888 "#B7861 [par Gustave BERGLUND & Brita PETERNELSON]." [S61] Upper Beaconsfield History Archive ,"his parents were both born in Sweden, and married 1856 in Boston USA (Gustaf born Stockholm & Brita born in Gottenburg)." [S185] Property Titles. ; PROV (Public Records Office Victoria), C/T 1123-557 - Charles Alexander Berglund of 120 Rupert Street Collingwood Civil Servant. [S185] Property Titles. ; PROV (Public Records Office Victoria), C/T 2618-460 - Charles Alexander Berglund of Templarville Rupert Street Collingwood Federal Civil Servant. [S185] Property Titles. ; PROV (Public Records Office Victoria), C/T 1110-754 + 1115-854 - Charles Alexander Berglund of Rupert Street Collingwood Civil Servant. [S185] Property Titles. ; PROV (Public Records Office Victoria), C/T 1139-622 - Charles Alexander Berglund of Rupert Street Collingwood Civil Servant. [S185] Property Titles. ; PROV (Public Records Office Victoria), C/T 1154-716 - Charles Alexander Berglund of Rupert Street Collingwood Civil Servant. [S185] Property Titles. ; PROV (Public Records Office Victoria), C/T 1139-624 - Charles Alexander Berglund of Rupert Street Collingwood Civil Servant. [S185] Property Titles. ; PROV (Public Records Office Victoria), C43 - C/T 1154-715 - Charles Alexander Berglund of Rupert Street Collingwood Civil Servant. [S185] Property Titles. ; PROV (Public Records Office Victoria), C/T 1139-623 - Charles Alexander Berglund of Rupert Street Collingwood Civil Servant. [S185] Property Titles. ; PROV (Public Records Office Victoria), C/T 2079-606 - Charles Alexander Berglund of 120 Rupert Street Collingwood Civil Servant. [S185] Property Titles. ; PROV (Public Records Office Victoria), C/T 1826-107 - Charles Alexander Berglund of Templar Ville Rupert Street Collingwood Federal Civil Servant - C/T 3324-719. [S185] Property Titles. ; PROV (Public Records Office Victoria), C/T 1110-754 + 1115-854 - George Hodges Knox of 31 Queen Street Melbourne Gentleman - C/T 3639-650+651. [S185] Property Titles. ; PROV (Public Records Office Victoria), C/T 1123-557 - George Hodges Knox of 31 Queen Street Melbourne Gentleman. [S185] Property Titles. ; PROV (Public Records Office Victoria), C/T 1098-419 - The Union Trustee Company of Australia Limited to Charles Alexander Berglund of The Towers Upper Beaconsfield Insurance Agent. [S185] Property Titles. ; PROV (Public Records Office Victoria), C/T 4702-300 - Charles Alexander Berglund of 99 Rupert Street Collingwood Insurance Agent. [S185] Property Titles. ; PROV (Public Records Office Victoria), C/T 4702-300 - George Joseph Thomson of Upper Beaconsfield Agent. [S185] Property Titles. ; PROV (Public Records Office Victoria), C/T 1528-554 - Richard Francis Board of Toomuc Valley Road Pakenham Builder. [S185] Property Titles. ; PROV (Public Records Office Victoria), C/T 1120-996 - By vesting order dated 1st June 1948. The within described land became vested in Charles Alexander Berglund for an estate in fee simple - C/T 7093-580. [S185] Property Titles. ; PROV (Public Records Office Victoria), C/T 1120-996 - Dalkeith George Noel Chambers of "Blue Ridge" Upper Beaconsfield Grazier - C/T 7726-012. [S11] Newspaper - Argus 23 May 1953 p18. [S185] Property Titles. ; PROV (Public Records Office Victoria), C/T 1098-419 - to C/T 8177-266 (consolidated title with GEM-C-39.40.41.44.45). [S35] Probate Records, PROV (Public Records Office Victoria), VPRS 28/P4, unit 561; VPRS 7591/P3, unit 5. [S12] Newspaper - South Bourke and Mornington Journal 29 Dec 1909, p2. [S12] Newspaper - South Bourke and Mornington Journal 7 Nov 1912, p3. [S12] Newspaper - South Bourke and Mornington Journal 23 Oct 1913, p2. [S11] Newspaper - Argus 12 Mar 1936, p11. [S11] Newspaper - Argus 13 Feb 1937, p4. [S11] Newspaper - Argus 17 Sep 1938, p22. [S11] Newspaper - Argus 23 Oct 1946, p17. [S11] Newspaper - Argus 17 Jan 1948 p2. [S11] Newspaper - Argus 22 Mar 1948, p9. David Russell, whose untimely death is reported elsewhere, worked most of his life with the Berwick owned business of Loveridge's, and succeeded his father as Manager of the B. U. store on Bill’s retirement shortly after his 70th birthday. The Milk Bar (presently leased by Tom Van der Dolder, previously by Allens and Cooks, and owned retrospectively by Beckwith, Stuckett, Pingo, Colles and Mrs G. Thompson) was a confectionery and fruitmongery conducted by Horner and Funnell. Immediately adjacent (now Mick O’Riley and Anne McKay's art/craft enterprise) was a grocery conducted by Bill Berglund, whose father created “The Towers” on the road after his own name. Across Halford Road was Tom “Sport” Brady’s hire coach shed (now still exhibiting well-weathered petroleum advertisements). A former garage owner in Melbourne, Tom retired to B. U. and lived in a small in-built section of the building which was formerly the co-operative fruit packing shed at Beaconsfield railway station. Across the Emerald Road, now Jack Stephen’s butcher's shop, was “Boss” Shorthouse’s headquarters for a Royal Mail and passenger horse coach/bus service. (Later Bill Berglund’s grocery moved to this site). Bill Russell, who lived with his family in Berwick, came into Loveridge’s employment as counter hand and delivery man in the early 1930’s when Loveridges bought the business from Nathan. Trading at that time continued to 10 pm. on Saturday nights to cater for the influx of weekend holiday-makers. Wednesdays were closed days. Bill slept in the store for a month then brought his family to rent "Rosemont" in A’Beckett Road (now Mrs Atkinson's). When Bill Noblet managed Loveridge’s (succeeding Syd Dean), Bill Russell moved into the Berglund shop and cottage at the rear, and subsequently purchased it. When Mrs. Russell died about 18 years ago, the former grocery shop (then acting as a bed-sitting room) was leased to Jack Stephens. Prior to this Jack was a taxi cab operator in Emerald. Among Bill Russell’s regular chores some 40 years ago was the delivery of 44 gallon drums of lime-sulphur to the many orchards, by horse and dray. Later it was in the comfort of a 13 model Ford motor truck. Bill ultimately took over the management of Loveridge’s for 4 years, before son David was to give him a well earned rest. Like the publicity he received when phasing out of a long association with the store, Bill's mother Celia came very much into the limelight when she celebrated her 100th birthday at the Pine Grove Hotel. [S2] Registry of Births Deaths and Marriages Federation Index Victoria 1889-1901 "#B11482." [S185] Property Titles. ; PROV (Public Records Office Victoria), C/T 3936-023 - William Alexander Berglund of Upper Beaconsfield Poultry Farmer - C/T 5298-453. [S185] Property Titles. ; PROV (Public Records Office Victoria), C/T 5298-453 - Robert Evans Brandon of "Stonycroft" Upper beaconsfield Engineer and Ernest Edward Tyler of 499 Little Collins Street Melbourne Company Mangaer - tenants in common in equal shares - C/T 6025-926. [S185] Property Titles. ; PROV (Public Records Office Victoria), C/T 5452-322 - William Alexander Berglund of Upper Beaconsfield Storekeeper. [S185] Property Titles. ; PROV (Public Records Office Victoria), C/T 5452-322 - William Henry Russell of Upper Beaconsfield Grocer's Assistant. [S15] Newspaper - Village Bell "010-1980, p10 by Paul Easton." [S124] Electoral Roll for Australia, 1924 "location as View House, Upper Beaconsfield - as William Allan BERGLUND." [S125] Electoral Roll for Australia, 1925 "location as View House, Upper Beaconsfield - as William Allan BERGLUND." [S136] Electoral Roll for Australia, 1936 "only Grace listed at View House." Charles Bertram Berglund was a Corporal in the Light Horse, Citizen Military Forces of the Beaconsfield District when he enlisted on 10 Nov 1915, aged 26. His father wrote that Bert 'was Staff Sergeant-Major in various camps in Victoria and could not get to the Front, as he was either kidnapped or bolted with (then) Colonel Tivey's Brigade as staff officers were barred from going'. He embarked from Melbourne on board HMAT A11 Ascanius on 10 Nov 1915 as a warrant Officer with the 8th Infantry Brigade Train. He served in Egypt and on the Western Front. He was mentioned in despatches. SERN 8077. He died in France from influenza on 4 Nov 1918, just a week before the war finished. 14 Nov 1918, BERGLUND.-Officially reported died in France, of influenza, on 5th November, 1918, Lieutenant Charles Bertram Berglund, dearly beloved son of Mr. and Mrs. C.A. 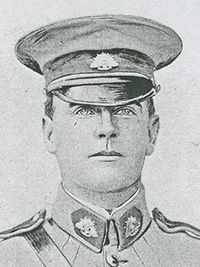 Berglund, of Collingwood and Upper Beaconsfield, devoted brother of Violet and William Alexander, and loved brother-in-law of Lieutenant Harold M. Horan (on active service in Palestine), dear uncle of Mervyn Berglund Horan. BERGLUND. In fond and loving memoir of our darling brother, Lieutenant C. B. Berglund, who died at Abbeville, France, on November 4. 1918. , Our dear Bert. Could wo have clasped our dear one's hand. The brother who was loved so well, To kiss his brow when death was near, And whisper, "Dear Bert, farewell." 4 Nov 1921, BERGLUND.-In cherished memory of Lieut. C. B. Berglund, who died in Abbeville (France) on the 4th November, 1918, dearly loved son of C. A. Berglund, J.P., and Mrs. Berglund, devoted brother of William A. Berglund (Upper Beaconsfield), Violet (Mrs. Horan, of Kew), nephew of W. J. Lalor, brother-in-law of Capt. H. M. Horan, and uncle of little Mervyn. 4 Nov 1922, BERGLUND. In cherished memory of Lieut. C. B. Berglund, died at Abbeville, France, on the 4th November, 1918; dearly loved son of C. A. Berglund, J.P., and Mrs. Berglund, of Collingwood; devoted brother of William A Berglund (Upper Beaconsfield), Violet (Mrs. Horan, of East Kew); nephew of Wm. J. Lalor; brother- in-law of Captain F. M. Horan; and uncle of little Mervyn. [S2] Registry of Births Deaths and Marriages Federation Index Victoria 1889-1901 "#B1544." [S11] Newspaper - Argus 2 Feb 1904 p7. [S14] Newspaper - Berwick Shire News and Pakenham and Cranbourne Gazette, 28 Oct 1914, p2. [S19] Newspaper - Berwick Shire News and Pakenham and Cranbourne Gazette "24 Mar 1915, p2." [S19] Newspaper - Berwick Shire News and Pakenham and Cranbourne Gazette "15 Mar 1916, p3." [S19] Newspaper - Berwick Shire News and Pakenham and Cranbourne Gazette "24 May 1916, p3." [S11] Newspaper - Argus 12 Nov 1918 p1. [S11] Newspaper - Argus 14 Nov 1918 p1. [S11] Newspaper - Argus 30 Nov 1918 p11. [S11] Newspaper - Argus 4 Nov 1919 p1. [S11] Newspaper - Argus 4 Nov 1921 p1. [S11] Newspaper - Argus 4 Nov 1922, p17. Anecdote* bt 1875 - 1880 Schlipalius, Charles Leopold (1848 - 1927). Born in Victoria, probably at Heidelberg, a suburb of Melbourne, on 14 December 1848, and died at Melbourne on 10 February 1927. Family information is that both he and his father, Charles Gustave Schlipalius (1823/24-1897), worked for F. Mueller at the Melbourne Botanic Gardens around the period 1875-80. The specimen of Eucalyptus bosistoana simply states the collector was ‘Schlipalius’ but it appears highly probable that Charles Leopold was the collector of the lectotype, since he is understood ‘to have collected specimens of eucalypts for classification’. Additional support comes from the family record that he had a personal knowledge of Gippsland, an area of south-eastern Victoria in which E. bosistoana occurs. His father, Charles Gustave Schlipalius, migrated from Saxony, Germany, in 1845. 380. To the Chairman.—I am a gardener, residing in Upper Beaconsfield. I have lived here seventeen years. I hold 310 acres, and have about 14 acres under cultivation—5 acres orchard, and the rest used for cropping. My nearest railway station is Beaconsfield, 6 1/2 miles away. There is a very fair road, only the hills are the drawback. I have produced nothing for a railway as yet, because the cost of sending to the railway station would eat up all the profit; the haulage comes very expensive. The proposed Oakleigh to Gembrook line, which we advocate, would go within half-a-mile of me; it does not go over my land. From within 4 or 5 miles of Oakleigh to where I am it will open up country. I cannot say how many acres are under cultivation. There is a great deal of production there that does not go by either railway, but by drays from Black Flats and Mulgrave. If there were a narrow-gauge line to Oakleigh people within 6 miles would do as they do now, and would not send to Oakleigh. From Oakleigh to my place is about 18 miles. I would guarantee to send a certain number of tons if there were a narrow-gauge line from my place to Oakleigh ; I could guarantee 2,000 tons of firewood. I have the timber there, but it does not pay to deal in firewood now, because of the cost of sending to a railway station. It costs 10s. a ton to take it the 6 miles from here to the railway station ; it used to cost 15s and £1 to within the last eighteen months. 381. To Mr. J. S. White.—If all other parts of the colony send in firewood, I cannot say whether we could all find consumption of it in Melbourne, if there were no consumption of course I would not send it. 382. To Mr. Harris.—There are abont 150 residents within a circle of a mile. People take only about 8 or 10 cwt. to the station by horse. I think we could place all that firewood; I have not made any inquiries about it. I think we could place it in Melbourne because it is the quality that is wanted. It is peppermint, which will make its way against messmate and stringybark. In advocating a line from Oakleigh to Gembrook, I reckoned that a line to start from Beaconsfield would never pay in itself, whereas starting from Oakleigh we should support it from start to finish, and it would pay on the construction fully 5 per cent. if it costs £2,500 a mile. If there were a deficit I would be willing to have my land taxed to make it up, because I have every confidence that it will pay. 1. LAND, being allotment 50 of section D, parish of Gembrook, county of Mornington, comprising nearly 310 a. of rich soil and undulating country, with most valuable frontages to Gembrook, Deeley's and Narre Warren roads, and highly favored with permanent water, a creek running through the centre. 2. BUILDINGS consist of good W.B. house, in capital order, and having large and lofty rooms; also, usual outbuildings of a well appointed farm. 3. Other IMPROVEMENTS comprise substantial fencing, home paddock of 3 a. under cultivation, underground tank 3500 gallons, and about 40 a, rich dark soil, and other portions ready for fruit growing and grazing. [S22] Victorian Government. BDM Index Victoria (online) "[par Gustavus Carl SCHLIPALIUS & Theodore Emmy MARIE] - listed as SCHLIPALUIS, reg Melbourne." [S1] Registry of Births Deaths and Marriages Pioneer Index Victoria 1836-1888 "#M3294." [S185] Property Titles. ; PROV (Public Records Office Victoria), C/T 1923-488 - Charles Leopold Schlipalius of Beaconsfield Gardener. [S185] Property Titles. ; PROV (Public Records Office Victoria), C/T 1923-488 - Charles Leopold Schlipalius from Isaac Boynton and Edward Brooks - C/T 1930-850. [S185] Property Titles. ; PROV (Public Records Office Victoria), C/T 1927-274 - Charles Leopold Schlipalius of Stony Creek North Beaconsfield Gardener - C/T 2039-764. [S185] Property Titles. ; PROV (Public Records Office Victoria), C/T 1923-488 & C/T 1930-850 - Charles Leopold Schlipalius from The Commercial Bank of Australia Limited - discharged 18 Feb 1896. [S2] Registry of Births Deaths and Marriages Federation Index Victoria 1889-1901 "have birth certificate." [S22] Victorian Government. BDM Index Victoria (online) "Viewed birth certificate. It states that the birth was certified by Mrs Halford." [S185] Property Titles. ; PROV (Public Records Office Victoria), C/T 1923-488 & C/T 1930-850 - Charles Leopold Schlipalius from Charles Gustave SCHLIPALIUS. [S35] Probate Records, PROV (Public Records Office Victoria), Probate of Charles Gustave SCHLIPALIUS. 1896 Victoria. Report from the Parliamentary Standing Committee on railways on the question of selecting localities for the permanent survey of narow-gauge lines together with the appendices and minutes of evidence. Printed 18 August 1896, pp94-95. [S185] Property Titles. ; PROV (Public Records Office Victoria), C/T 1923-488 & C/T 1930-850 - Charles Leopold Schlipalius from John Elburn Lock. [S185] Property Titles. ; PROV (Public Records Office Victoria), C/T 1923-488 - Charles Leopold Schlipalius to Teresa Lang of North Beaconsfield, Married Woman - C/T 2777-361. [S185] Property Titles. ; PROV (Public Records Office Victoria), C/T 1923-488 & C/T 1930-850 - Charles Leopold Schlipalius from John Addy. [S185] Property Titles. ; PROV (Public Records Office Victoria), C/T 2039-764 - The Bank of Victoria - discharged 10 Jul 1911. [S185] Property Titles. ; PROV (Public Records Office Victoria), C/T 1923-488 & C/T 1930-850 - Charles Leopold Schlipalius from The Bank of Victoria Limited. [S185] Property Titles. ; PROV (Public Records Office Victoria), C/T 1923-488 & C/T 1930-850 - Charles Leopold Schlipalius from Samuel Eagleson. [S185] Property Titles. ; PROV (Public Records Office Victoria), C/T 1923-488 & C/T 1930-850 - Charles Leopold Schlipalius to King George V - C/T 3573-410. [S11] Newspaper - Argus 11 Feb 1927 p1. [S185] Property Titles. ; PROV (Public Records Office Victoria), C/T 2039-764 - Charles Leopold Schlipalius died on 10 February 1927. Probate has been granted to Jessie Ann Schlipalius of 9 William Street Malvern Widow. [S185] Property Titles. ; PROV (Public Records Office Victoria), C/T 2039-764 - Jessie Ann Schlipalius of 9 William Street Malvern Widow. [S12] Newspaper - South Bourke and Mornington Journal 23 Dec 1885, p3. [S12] Newspaper - South Bourke and Mornington Journal 15 Dec 1886, p3. [S12] Newspaper - South Bourke and Mornington Journal 9 Feb 1887, p3. [S11] Newspaper - Argus 9 Apr 1887 p5 (from Government Gazette). [S12] Newspaper - South Bourke and Mornington Journal 28 Mar 1888, p3. [S12] Newspaper - South Bourke and Mornington Journal 20 Jun 1888, p3. [S12] Newspaper - South Bourke and Mornington Journal 15 Jun 1892, p2. [S16] Newspaper - The Age 23 Apr 1894, p8. [S16] Newspaper - The Age 29 Jan 1896, p2. Death-Notice* 4 May 1931 SCHLIPALIUS.—On the 2nd May, at her residence, 9 William street, Malvern, Jessie Ann, relict of the late Charles L Schlipalius, dearly beloved mother of Charles, Leo (deceased), Bella (Mrs Carey, Sydney), Lettie (deceased), William (Sorrento), Jessie (Mrs Hopkins), Alf (Kilmany), Bert, Edith, and Harold, loved grandma of 29 grandchildren and six great-grandchildren, aged 77 years and 9 months. A colonist of 76 years. SCHLIPALIUS.-The Friends of the late Mrs. JESSIE ANN SCHLIPALIUS are informed that her remains will be interred in the St. Kilda Cemetery. VPRS 7591/ P2 unit 849, item 242/097. [S185] Property Titles. ; PROV (Public Records Office Victoria), C/T 2777-361 - Teresa Lang to Jessie Ann Schlipalius of North Beaconsfield Married Woman - C/T 3362-320. [S185] Property Titles. ; PROV (Public Records Office Victoria), C/T 3362-320 - Jessie Ann Schlipalius to King George V - C/T 3573-410. [S5] Registry of Births Deaths and Marriages Death Index Victoria 1921-1985 "#D5811 age 77 [par Abraham MARSHALL & Isabella Jane HUNTER]." [S11] Newspaper - Argus 4 May 1931 p1. [S185] Property Titles. ; PROV (Public Records Office Victoria), C/T 2039-764 - Jessie Ann Schlipalius died on 2 May 1931. Probate of her will has been granted to James Thomas Marshall of Upway Bookbinder and Alfred James Schlipalius of Kilmany South Gippsland Farmer. [S1] Registry of Births Deaths and Marriages Pioneer Index Victoria 1836-1888 "#B5569." [S3] Registry of Births Deaths and Marriages Edwardian Index Victoria 1902-1913 "indexed SCLHIPALIUS." [S80] Ancestry - Family Tree, "wandabush31" family tree. [S1] Registry of Births Deaths and Marriages Pioneer Index Victoria 1836-1888 "#B26475." [S1] Registry of Births Deaths and Marriages Pioneer Index Victoria 1836-1888 "#B11267." Death-Notice* 27 Jun 1932 CAREY.—On the 26th June, at Melbourne, Isabella, relict of the Iate Horace Arthur Carey, and loving mother of Jessie (deceased) and Arthur, late of Stawell, aged 56 years. CAREY.— The Friends of the late Mrs. ISABELLA CAREY are informed that her remains will be interred In the Melbourne General Cemetery, Carlton. The funeral will leave the residence of her brother, Mr. Harold Schlipalius, 9 William-street, Malvern, THIS DAY (Monday), 27th June, at 3.35 p.m., arriving at the cemetery about 3.50 p.m.
[S1] Registry of Births Deaths and Marriages Pioneer Index Victoria 1836-1888 "#B18541." [S5] Registry of Births Deaths and Marriages Death Index Victoria 1921-1985 "#D9421 age 56 - as CAREY." [S1] Registry of Births Deaths and Marriages Pioneer Index Victoria 1836-1888 "#B17745." [S3] Registry of Births Deaths and Marriages Edwardian Index Victoria 1902-1913 "index: #M1857 Alaf NELSON & Emma Letitia SCHLIPALUIS #M1857R Olaf August NELSON & SCHLIPALIUS Emma Letitia." [S119] Electoral Roll for Australia, 1919 "Olaf at previous address." Death-Notice* 7 May 1947 SCHLIPALIUS.—On May 6, at Alfred Hospital, William Henry Schlipalius, of Hotham road, Sorrento, beloved husband of Lucy, and loving father of Roy, Rose (Mrs. Seedsman), Walter, Reuben, and Albert, aged 67 years. [S35] Probate Records, PROV (Public Records Office Victoria), VPRS 7591/ P2 unit 1380, item 394/232. [S1] Registry of Births Deaths and Marriages Pioneer Index Victoria 1836-1888 "#B23227." [S5] Registry of Births Deaths and Marriages Death Index Victoria 1921-1985 "#D4648 age 67." [S11] Newspaper - Argus 7 May 1947 p2. Death-Notice* 6 Jul 1954 HOPKINS, Jessie Marshall.—On July 5, at private hospital, Hawthorn, dearly loved wife of Percy I. Hopkins, Harold street, Chelsea, beloved mother of Cecil, Gladys (Mrs. G. A. Morris), Lyla (Mrs. R. J. Baker), Percy, Lily (Mrs. H. Davy), Ivy (Mrs. A. Bush), Pearl (Mrs. C. Midolo). Mother, oh mother. We miss you so much, Your life and your hands were ready to touch. Now we will miss you with many a tear, From your hubby and children, For you were so dear. HOPKINS, Jessie Marshall. — Dearly loved mother of Gladys, and son-in-law George, beloved grandma of Geoffrey, Helen, David, and Francis, of Camberwell. HOPKINS, Jessie Marshall.—On July 5, at private hospital, Hawthorn, dearly loved sister of Alf, Edith, and Harold Schlipalius. [S1] Registry of Births Deaths and Marriages Pioneer Index Victoria 1836-1888 "#B13933." [S3] Registry of Births Deaths and Marriages Edwardian Index Victoria 1902-1913 "listed as Percy Ida HOPKINS & Percy Ide Lpkins." [S5] Registry of Births Deaths and Marriages Death Index Victoria 1921-1985 "#D7332 age 72 - as HOPKINS." [S11] Newspaper - Argus 6 Jul 1954, p11. [S16] Newspaper - The Age 30 Aug 1954, p15.